A totally new software design, using the .NET framework. Unlike PC-DNC Plus, PC-DNC Pro* runs as a service, without the need for a user to log-on. Since the PC-DNC Pro* service runs invisibly in the background, the only thing you will see on the screen is the PC-DNC Pro* client (shown below). The Client can be closed and the service keeps running invisibly. Clients can be installed on any PC that's connected to your server PCs network. A PC-DNC Pro* client can be run on many other PCs simultaneously, but only one service does all the DNC work. Like its predecessor, PC-DNC Plus, you call up files with "remote" commands from your CNCs keyboard, and you can use it as a manual file queuing system. Features include machine cycle monitoring, automatic data collection, and wireless support so you can queue up files using your Droid or IPhone from the shop-floor. Supports native COM ports, USB adapters, Ethernet serial devices and Wireless Ethernet devices. PC-DNC Pro Client* lets you control the server from any PC on your network. Free software updates at any support contracts or "per incident" support via phone or email. 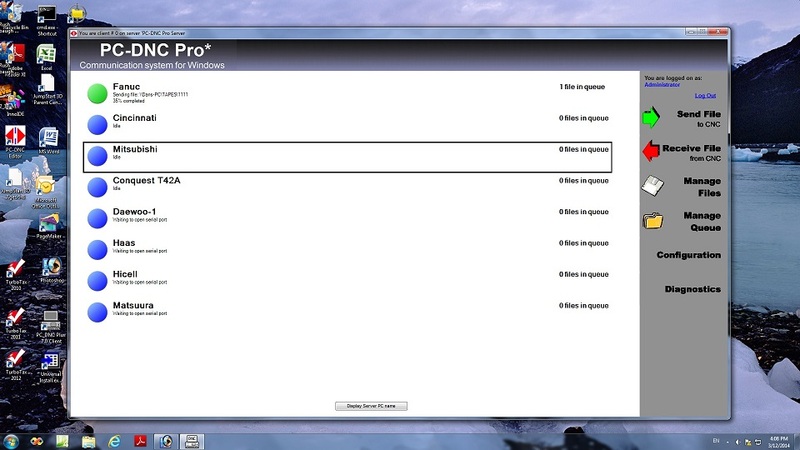 PC-DNC Pro installs and runs as a Windows service. Unlike PC-DNC Plus, which is a standard Windows application, PC-DNC Pro is a multi-threaded service that can be controlled using a PC-DNC Pro Client (shown above), which can run on any PC on your network. When you start your computer, the PC-DNC Pro service loads and runs automatically, and does not require a user to log on to the PC. You can use the Windows "Services" menu to assign a system user account to the PC-DNC Pro service if needed. PLEASE NOTE: Since PC-DNC Pro runs as a service, you can not use "mapped" drive letters when sending files to or reading files from a network server. Instead, you must specify complete UNCs path on your network server for each directory accessed by PC-DNC Pro on your network server. PC-DNC Pro can be configured to communicate with any number of ports (from 1 to 256). Since each DNC window is simply another iteration of the same 1-port DNC application, there is far less complexity to the software design. Each DNC window functions independently of all other applications. You can open, close, or reset each DNC window individually, or you can control them all as a group from the main command window. Since each DNC window is a separate thread within the service, an error that might occur in one DNC window is isolated to one element of the system, and does not affect other DNC windows or the main client command window. A PC-DNC Pro "server" can communicate with up to 255 CNC machines. A PC-DNC Pro "client" can connect with any PC-DNC Pro server on your network, and can be used to perform any manual operation that might be needed. Our "floating client" licensing method permits many clients to connect with each server, regardless of where they are located on the network. If your facility has multiple PC-DNC Pro servers in operation, any client can connect with any server that is currently running. The Install program for PC-DNC Pro Server includes one Client, which can be run without restriction on the same PC that is running the Server. To run the client on any other PC on your network (one that does not run the service), download and install the PC-DNC Pro Client software by clicking here. PC-DNC Pro lets you upload & download files using remote commands from the CNCs keyboard, or you can manually "queue" files for sequential output to the CNC. Remote commands are freely programmable so that you can easily accommodate the keyboard restrictions on various CNC controls. When a file is requested from the CNCs keyboard, PC-DNC Pro can be configured to search for the requested file in any sequence of subdirectories (folders) or sub-folders. Files can be queued directly from a file list box with a toolbar button, or by dragging & dropping the file from the file list to the CNC control’s window. You can also use OLE (Object Linking and Embedding) to drag & drop files from other applications, such as Windows Explorer. You can easily edit or re-arrange the queue list if the sequence of files needs to be changed. Files that are manually queued can be sent automatically after a specified time delay. This way, you can configure PC-DNC Pro to download a file to a BTR board or tape punch/reader as soon as it is queued on the PC-DNC Pro system. An automatic queue function lets PC-DNC Pro "find" any file that is placed in a designated subdirectory (folder), and queue it for output to the CNC control. By copying a file to this designated "auto-queue" folder, PC-DNC Pro will automatically queue that file to be transmitted to the CNC. This can be done with any one of several FREE file explorer apps for Android or Apple smart phones. PC-DNC Pro can also upload files from the CNCs using automatic tape code recognition and automatic program ID recognition. Uploaded files can be stored in separate "upload" directories to prevent confusion with proven files. An automatic versioning system can also assign version numbers to uploaded files. PC-DNC Pro includes a powerful "Tool Break Editing" feature. If a DNC cycle is interrupted for any reason, you can quickly highlight the portions of the file you want to run again, stitching together any segments of the file into a special "one-time" sequence. You can then cycle start your CNC again to run only those selected blocks of data. Once the edited sequence has executed, the DNC window discards the edited sequence and returns to normal DNC operation. Each PC-DNC Pro Client includes our powerful PC-DNC Editor for quick & easy editing of your NC data files. Toolbar buttons on the PC-DNC Pro main window permit a quick-link to PC-DNC Editor and to the editor's powerful File/Compare function. PC-DNC Editor includes many powerful functions for modifying G-code files, as well as a variety of pop-up calculators and reference files. A more detailed description of the PC-DNC Editor is shown in a subsequent section. PC-DNC Pro has a comprehensive "logon" security system, which can be disabled for those shops not requiring user logon security. With the system activated, you can restrict individual users to the use of certain specified manual operations on a specified group of machines. Users are required to log on and log off using their own names and passwords. A Security Manager program lets the system administrator enter user names, passwords, and machine access privileges. All password information is encrypted and stored in a "fail-safe" mode, which restricts all access by anyone but the administrator if tampered with. A machine cycle monitoring feature lets you automatically record "Cycle-start" and "Cycle-end" events from any machine on your system. Information collected can then be analyzed and displayed as a bar-graph/time chart, and relevant statistics such as the number of cycles, average cycle time, average load time, and uptime/downtime ratios are calculated for you. Once a time period has been selected for analysis, the Cycle Time Analysis module will let you select any "Job" that was run within that time period for further analysis.